Unless there's an R in the Month ! Oyster harvesting on Georgia's coast is off limits for three months to protect people eating the shellfish from bacteria sometimes found in warm summer waters. The state Department of Natural Resources said the ban on commercial and recreational harvesting started Friday and continues until October. Dominic Guadagnoli, the DNR's shellfish program manager, said Vibrio parahaemolyticus (Vp) bacteria is found in filter-feeding shellfish when estuarine water temperatures exceed 81 degrees. Summer also is spawning season, and the combination of reproduction and warm water makes oyster flesh less desirable. May through September accounts for less than 2 percent of Georgia's annual harvest. Guadagnoli said commercial oystermen have long been aware of the Vp threat and fully support the closure. Steve Braden was here last night giving his excellent slide presentation on weather systems and the SE. Some great graphs and diagrams combined with everybody's personal encounters made for an excellent evening. Ironically, we had to take a break half way through when the power went out as a fast moving storm rolled through the neighbourhood. 'That was cool' we thought. We will be having a gear swap two thursdays from now on July 10th. Ben Lawry will be presenting here July 31st. This last weekend marked the middle of the year. So, with half gone, we enter into Part Two of 08'. No sign of a recession here yet, but gas prices are causing us to maximize our trips to the islands by synchronizing program times to use one vehicle. The Summer weather pattern is setting in nicely, with some awesome afternoon storms really packing a punch...so no more afternoon programs. Thursday's afternoon storm saw dime size hail and 60mph plus winds, flooding downtown and snarling traffic. Savannah resident Billy Kitchens says a pine tree fell through the middle of his mobile home while he hid in a closet. Summer is here, get the family paddling. We say "No better way to see in the weekend than a surf demo". We had a great turn out last night with friends and folks trying, many for the first time, a ride in the surf. The SOT's are the ice breaker, then come the surf boats and the Wave Ski is the ultimate test. Just under 20 people tried all or some of the wave craft. Willy H brought out his solo canoe for a bit of extra flair in the small but suitable surf conditions. Next scheduled surf demo will be Friday, Aug 15th. Classes all summer long. Seven kids and two mums made up the Sea Sprouts kayak sessions this week. Over two days the Sprouts learnt to handle a variety of paddle craft including sea kayaks, whitewater kayaks and SOT's. Of course, it did not really matter what the boat, just as long as it floated. On the first day we practiced Scene safety, basic rescue techniques and driving lessons on the Skid away Narrows. 'How to rescue my best friend' was the favourite game. On Wednesday we put it all together and went on an adventure over to Little Tybee to explore the tide pools and creeks. Everyone decided it was "Excellent fun" and "the best kayaking I have ever done." When youngsters get turned on to paddling it's a very successful and satisfying program. kayaking but fun summer memories. We'll be in touch for more adventures. The newest member of the SCK team is local Tybee lad, Stephen Lockwood. Although not old enough to 'Lead Guide' Stephen will be learning and assisting in all aspect of the commercial kayak guiding business. As well as turning him into a first rate paddler we will give him a fall back career that he will be able to utilise at any time or place. We think Stephen has all the characteristics that make a first rate sea kayak guide. 'Strong and polite' are two of his qualities that immediately show. "Welcome aboard Stephen. Now get cleaning." Tybee Race -Last is the new First. 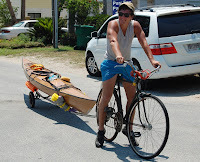 Saturday was Race Day on Tybee and anybody who is anybody in the paddling community was there to show their support. There are three races, the main one being the Little Tybee Challenge, a 9 mile paddle around part of L.T. It was a great turn out with many new faces taking part. Outrigger canoes, race boats and SOT's were all represented in this great little on water festival. Kristin and myself organized the Safety Boat Committee but the conditions were calm and no rescues were required. Doc Marlay maintained his unbeaten record of Last Place for the Challenge as he was narrowly usurped by Carol, racing for the first time. Proudly sporting her pearl necklace, Carol was more than pleased with her Second to last place finish.
" Darling, when God gives you Lemons, make Long Island Lemonade." she said afterwards. My wife Diane and I wanted to send along a sincere and hearty thanks for providing us with wonderful afternoon of kayaking off Tybee Island. You were the perfect guide and made the outing both fun and educational. The afternoon we spent paddling over to Little Tybee and then around the marshes was one of the highlights of our vacation and we eagerly look forward to booking your services the next time we visit the area. Until then we’ve decided to purchase a couple of kayaks of our own and begin exploring the waters here in Ohio and Kentucky. We’ve caught the kayaking bug! Also, we purchased a couple of SC&K caps from your website and will definitely recommend your company to everyone we know." A Bad Case of Neglect. We found this pathetic specimen of a Pit Bull abandoned in the gutter just down our street. Unable to stand, covered in fleas and some stinky chemical, the emaciated little lady was on here last legs. Kristin got the jeep and we transported her straight over to Doc Marlay's clinic. We think she will make a recovery and then come here and hang out with Joey for a period of rehabilitation. She will then be put up for adoption.